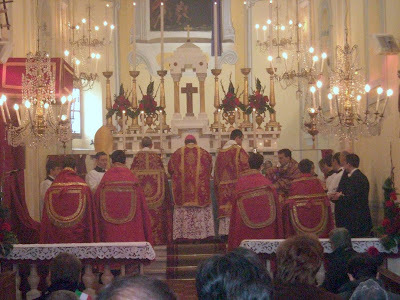 While in the modern Roman liturgy we today celebrated the 4th Sunday in Ordinary Time, and will celebrate the 5th and the 6th Sundays in Ordinary time respectively in the next two weeks, and while green vestments are worn on these Sundays, within the usus antiquior we would have noted today violet vestments, no Gloria and no Alleluia. This is because, in accordance with the calendar of the usus antiquior, we have entered the pre-Lenten period, respectively referred to each successive Sunday by "Septuagesima" (seventieth), Sexagesima (sixtieth), and Quinquagesima (fiftieth) -- these numbers being symbolic, tied to the reference of "Quadragesima" (fortieth) which comes in reference to the forty days of Lent of course. That rule [permitting vernacular hymns] has been superseded. What must be sung is the Mass, its ordinary and proper, not “something,” no matter how consistent, that is imposed on the Mass. Because the liturgical service is one, it has only one countenance, one motif, one voice, the voice of the church. 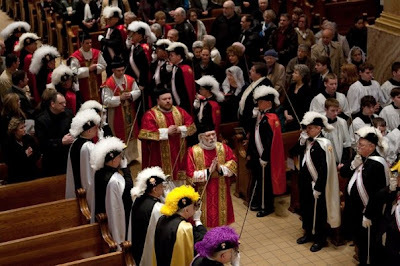 To continue to replace the texts of the Mass being celebrated with motets that are reverent and devout, yet out of keeping with the Mass of the day amounts to continuing an unacceptable ambiguity: it is to cheat the people. Liturgical song involves not mere melody, but words, text, thought, and the sentiments that the poetry and music contain. Thus texts must be those of the Mass, not others, and singing means singing the Mass not just singing during Mass. Those of our readers who are more particularly specialized in their sacred music interests may be interested in this forthcoming offering from the Digital Imaging Archive of Medieval Music at the University of Oxford. The price is not for the faint-hearted I would forewarn, but for those of you who have a particular academic or specialized interest in this, you would probably do well to order a copy sooner than later as this sort of title is often seen to be printed in limited runs, only to disappear. 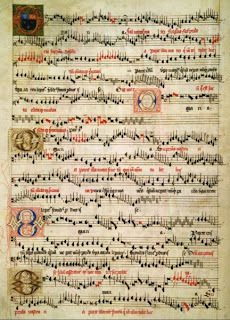 One of the most iconic of music manuscripts, the Eton Choirbook is of unique importance, both in its own right as a cultural artefact and as a source of English choral polyphony composed during the late fifteenth and early sixteenth centuries. Had it perished, along with so many other (less fortunate) pre-Reformation music manuscripts, our knowledge of a critical moment in the history of English music would have been immensely diminished. 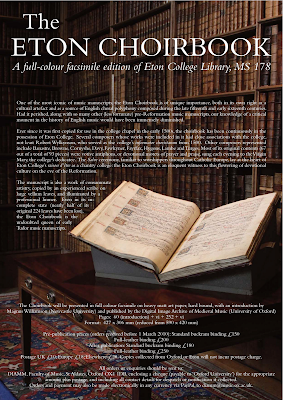 Ever since it was first copied for use in the college chapel in the early 1500s, the choirbook has been continuously in the possession of Eton College. Several composers whose works were included in it had close associations with the college, not least Robert Wylkynson, who served as the college’s informator choristarum from 1500. Other composers represented include Banastre, Browne, Cornyshe, Davy, Fawkyner, Fayrfax, Hygons, Lambe and Turges. Most of its original contents (67 out of a total of 93 pieces) were votive antiphons, or devotional motets of prayer and praise, sung each evening to the Virgin Mary, the college’s dedicatee. The Salve ceremony, familiar to worshippers throughout Catholic Europe, lay at the heart of Eton College’s raison d’être as a chantry college: the Eton Choirbook is an eloquent witness to this flowering of devotional culture on the eve of the Reformation. The manuscript is also a work of consummate artistry, copied by an experienced scribe on large vellum leaves, and illuminated by a professional limner. Even in its in-complete state (nearly half of its original 224 leaves have been lost), the Eton Choirbook is the undoubted queen of early Tudor music manuscripts. * Postage UK £10; Europe £18; Elsewhere (except N America - see below) £28. Copies collected from Oxford or Eton will not incur postage charge. DIAMM, Faculty of Music, St Aldates, Oxford OX1 1DB, enclosing a cheque (payable to ‘Oxford University’) for the appropriate amount plus postage, and including all contact details for despatch or notification if collected, or purchased directly through our online shop. Orders and payment may also be made electronically in any currency via PayPal, to diamm@music.ox.ac.uk, or via our online shop. Please contact DIAMM or OMI if you wish to make multiple purchases to enquire about discounts, or if you are a retailer. 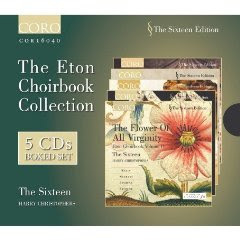 Those who would simply be interested in hearing the liturgical music found within the Eton Choirbook will be interested to know that The Sixteen (who are absolutely excellent) have recorded the music found within the Eton Choirbook within a wonderful box set edition. 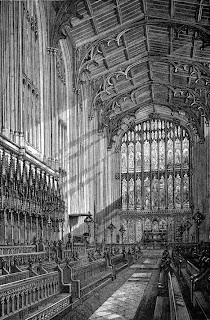 Samples of their work and the music found within the Eton Choirbook may be found by visiting the link above. Many of our readers enjoy photos of churches, particularly those they may not hear of so often (if at all), as it gives them a chance to play "tourist" while also providing an opportunity to consider their beauty and history. In my estimation, such a simple exercise is not only spiritually edifying or historically informing, it can also help to inform our sense of our architectural and artistic tradition which is an important foundation for our approach (or re-approach) to sacred art and architecture today. This is true not just from the perspective of art and architecture, but also from the perspective of the ordering of our churches for the sacred liturgy. I am often hopeful that these very simple photo essays will somehow inspire pastors and patrons, architects and artists, liturgists and laity, in these various regards. 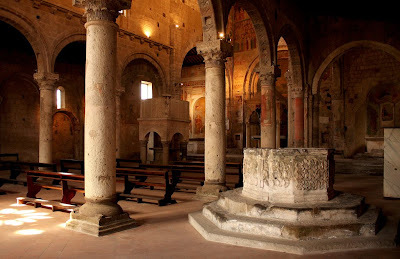 Today, I wished to share these photos of another "Santa Maria Maggiore", located in Tuscania, which is in the province of Viterbo in the Latium Region of Italy. Whenever I see historical ambos, a point never fails to arise in my mind -- one which we have raised here numerous times before. Very often today, what amounts to an ambo is essentially a small podium, pulpit or lectern placed within the sanctuary. It seems to me that it would be of merit to consider the revival of more significant ambos again; ambos that approximate more closely to those found within our tradition. This would have an effect of lending an even greater dignity and gravity to the Liturgy of the Word. On Monday, the Pope appointed new members to the Supreme Tribunal of the Apostolic Signatura, presided over, of course, by one of the greatest patrons of the usus antiquior, Archbishop Raymond L. Burke. One of the new members is Mons. Fernando José Monteiro Guimarães, C.Ss.R., Bishop of Garanhuns (Brazil). Mons. Guimarães had been, until his appointment as ordinary of Garanhuns in 2008, head of department in the Congregation for the Clergy. In this capacity, and as collaborator of the then-Prefect, Cardinal Castrillón Hoyos, he has been instrumental in the regularisation of Campos and the creation of Personal Apostolic Administration of Saint John Mary Vianney, as well as the erection of the Institute of the Good Shepherd (IBP). H/T to Una Voce Málaga. Yesterday I posted my introduction to The Wanderer's edition of Msgr. Marini's address to the conference on the year of priests. On reflection, I found my essay plodding, dull, and pompous, the way you write when you have writer's block that stems from intimidation. So in my second draft here, I loosened up and spoke more directly to the point, shelving all pretensions. Among Catholics who have a sound appreciation of sacred music and solemn liturgy, Monsignor Guido Marini is a folk hero. As Pontifical Master of Liturgical Ceremonies, he has a huge international presence. We see him on television and on youtube, always standing near the Pope during Vespers or Mass. He holds Benedict XVI's eyeglasses and hands them to the Pope just before he reads the Gospel. He very subtly organizes what happens in the sanctuary with very small eye movements and twitches of the finger. His heads is always slightly bowed in deference to both the Pope and to his task. What we do not see on television is all the front-man work when the Pope travels to foreign lands, improving the liturgical furnishings and vestments as best he is able. It is clear that he combines his beautiful aesthetic with a great sense of politics. He is at once firm but gentle. On the one hand, he has a high profile; on the other hand, he has a very small "footprint" when doing his work in the sanctuary. Like a great MC, he is easy to overlook, and seems, in fact, happy to be overlooked. There is an embedded humility to the way he does what he does. I know for a fact that there are many young men in the United States who look to Msgr. 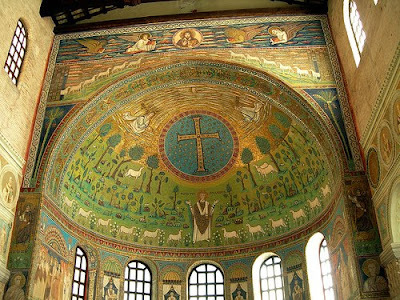 Marini as a model: a master of what he does, and a loyal and faithful servant of the faith and the office of the Papacy in its liturgical work. He seems to understand that what goes on at Papal liturgies sets a tone and style for the world. He takes this responsibility very seriously, with intense focus on every detail, consistent with the long tradition of MCs. He even looks the part in a wonderful way: studious, thin, a bit geeky, but with a charming smile and gentle demeanor. Msgr. Marini was born in 1965, at the close of the Second Vatican Council, a man raised and educated in a postconcilar world. 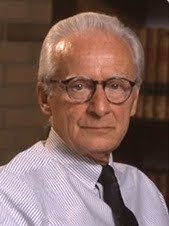 He earned two doctorates, in psychology and law (a dual award in canon and civil law). As for his specialization today, it is surely the product of untold hours of disciplined private study. Pope Benedict XVI elevated him to his current position as MC on October 1, 2007. In that position, he has transformed Papal liturgy in the most thrilling way, making every liturgy a bridge from the past to the future. For Americans, the office of MC is something that has only recently entered public consciousness. For so long, the very idea of "ceremony" has been depreciated in the Catholic world, regarded as somehow inauthentic and remote. It has been believed that ceremony is too cold and distant for a modern world that demands a steady diet of warm fuzzies. And yet what in fact ends up being the replacement for ceremony? The arbitrary whim of human choice, the glorification of the liturgical committee, and the personality of the celebrant. The result is not the Roman Rite, which came to be structured not to highlight human personality but rather to provide a perfect structure for the encounter with God. As St. John the Baptist said, we must decrease and so that He can increase. This is as true in liturgy as it is in life. Ceremony is what permits this to happen. "Ceremony in liturgy, an external action, gesture, or movement which accompanies the prayers and public exercise of divine worship. 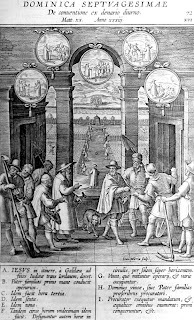 To these the Council of Trent (Sess. XXII, cap. v.) adds the things over which or with which the prayers are pronounced, e.g. blessings, lights, incense, vestments, etc. 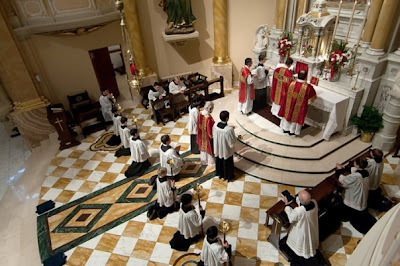 Ceremony is the necessary outcome of the twofold nature of man, intellectual and sensible, on account of which, as St. Thomas Aquinas says (Contra Gentiles, III, cxix), he must pay God a twofold adoration, one spiritual, which consists in the interior devotion of the soul, the other corporal, which manifests itself in the outward form of worship, for there is no inward sentiment or feeling which man is not wont to express outwardly by some suitable gesture or action. Ceremonies are employed to embellish and adorn sacred functions; to excite in the faithful sentiments of respect, devotion, and religion, by which the honor of God is increased and the sanctification of the soul is obtained, since these constitute the principal object of all liturgical acts; to lead the illiterate more easily to a knowledge of the mysteries of religion; [and] to indicate the dispositions necessary to receive the sacraments worthily..."
As a result of the depreciation of ceremony, there might not be more than a dozen or two qualified MCs for the Roman Rite in this country. It is not a high-paying job, and, actually, it isn't a job that pays at all. They are in high demand in these times of the revival of ceremony, traveling from liturgy to liturgy, giving of their time and providing their expertise. Musicians like to complain about how much training goes into their craft and how it is not sufficiently rewarded by the marketplace, but this is even more true with mastery of liturgical ceremony. Most MCs in this country work in some other profession during the day - software developer, professor, high-school coach - and do their MC work on night and weekends. They have spent many years studying books that most Catholics don't even know exist. For most of us, books on rubrics read like theoretical physics. The level of detail of something like Adrian Fortescue's Ceremonies of the Roman Rite Described can be overwhelming. To master them all is the equivalent of learning Icelandic fluently. The job is immensely complicated by the prevalence of two forms of the Roman Rite: extraordinary and ordinary, the latter of which is actually deficient in rubrical description. It is thereby part of Msgr. Marini's job to pull together the two forms of the Rite, infusing the new with the spirit of liturgy of the ages. 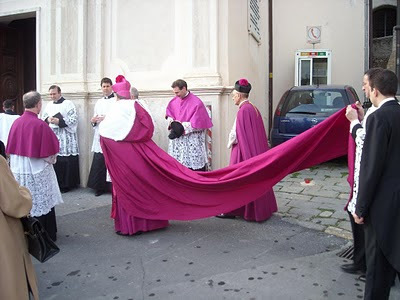 Here, the holiness is in the details: how Sanctus torches are carried, how many steps the subdeacon walks in the Gospel procession, the manner in which the vestments are handled during Vespers, and one million other tiny details. The closer you look at these details, the more we see that they have a basis in Catholic theology - a basis which is not always immediately clear but which emerges from scholarship and reflection. The effect of all of this is an orderly beauty so astonishing that we forget about the details and enter into prayer in the most profound way possible. What we find in this address by Msgr. Marini is that he is not only a master of rubrical detail; he is also a master of the theology and theory of the reform. 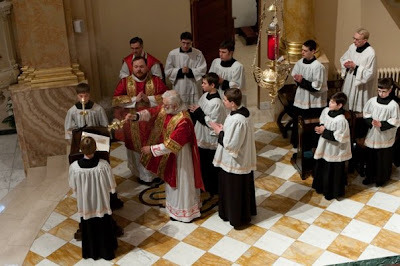 He explains the urgent need to see a continuity between old and new, to have an orientation toward God, not the people, during liturgy, to use music that is an embedded part of the tradition, and to generally get very serious about what we are doing. It is an enormous pleasure to read his words, to gain an understanding of the rationale that serves as the intellectual and spiritual foundation for what we see and experience. The significance is even greater. This statement by Msgr. Marini is one of the most public and transparent defenses of the side-by-side life of the older and newer uses of the Roman Rite. He is urging us to look to the past as a way forward. In this way, I do think it is legitimate to call him a true Catholic progressive in the best sense of that term. So it is my great pleasure to give you this seminal speech with words and thoughts suitable in any age but especially important because they show the path toward a bright future for the Roman Rite. The Italian language Zenit has another article up by Fr. 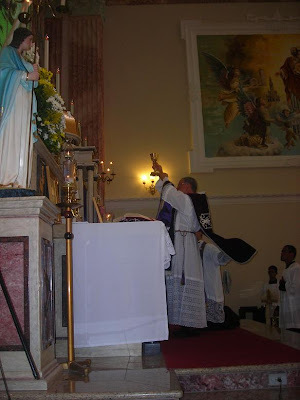 Mauro Gagliardi, l sacerdote nella Liturgia della Parola della Santa Messa (The Priest in the Liturgy of the Word of the Holy Mass) wherein he considers the readings of the Mass in the Roman rite in both the ancient and modern forms. He considers how they are similar and how they differ; how the usus antiquior can enrich the modern form in terms of the sacred posture taken during the proclamation of the readings, and what gains he sees with regard to the modern form of the Liturgy of the Word. Specifically, in the latter regard, he offers praise of the renewed use of the ambo, of the readings being said in the direction of the faithful and of the increased amount of scripture -- while also making a point of critique about what he sees as the undue length of some of the readings of the modern lectionary, and also the lack of rubrical guidance on the posture to be taken during the readings -- and hence, the potential for enrichment here from the ceremonial of the usus antiquior. As Zenit has been making this series available in English, the NLM will not pursue a translation but simply wait for their English translation to appear. However, for those who would like to read ahead, please see the link above. If that is forthcoming today, this post will be updated. While we are mentioning Fr. Gagliardi's Zenit series, I would also draw your attention to a piece that was released on January 8th on Zenit, which is an interview on the subject of the traditional elements we have seen reintroduced within the papal liturgies. Matthew Alderman. St. Joan of Arc with SS. Louise de Marillac and Francis de Sales. 10" x 13.5". Private Collection, Wisconsin. January 2010. 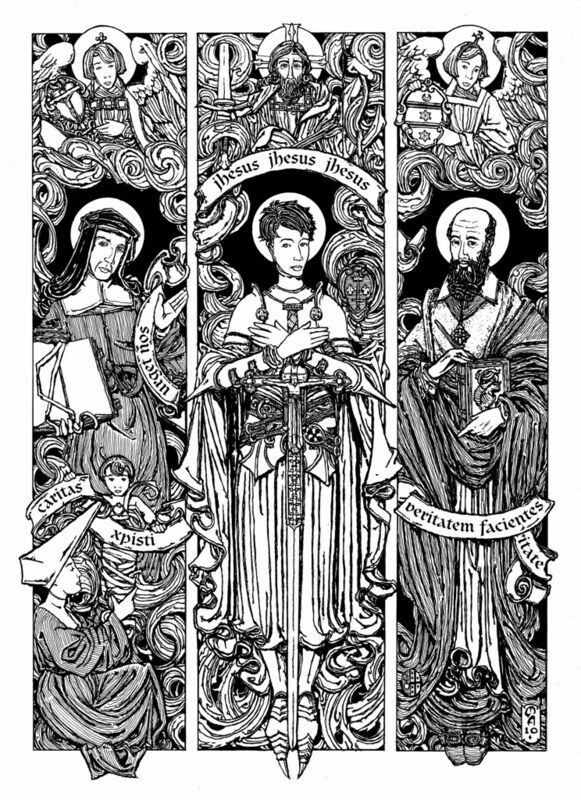 Towards the end of last year, I was approached by two clients, independently, who both commissioned ink illustrations of St. Joan of Arc--one for his girlfriend for a Christmas present, the other for his wife, as a gift on her birthday, that is, today, the Extraordinary Form feast of St. Francis de Sales. I have already posted about the first Joan over at The Shrine (and may crosspost it over here at some point in the future), and this item is about the second. These two projects were particularly challenging, given I have always worked hard not to repeat myself. Liturgical illustration and iconography is formulaic by its nature, at least as to content, but certainly there is some degree of latitude when it comes to rendering that content visible, at least up to a certain point. The great Irish stained-glass designer and illustrator Harry Clarke often referred to the various tics of color and contrast he experimented with as his latest "gadgett" (sic), a self-depreciating term which belies the strong iconographic (if occasionally somewhat stylisticially idiosyncratic) quality of his work. As I have written elsewhere, St. Joan's iconography is deceptively simple--girl in armor, banner, fleurs-de-lys, enough. 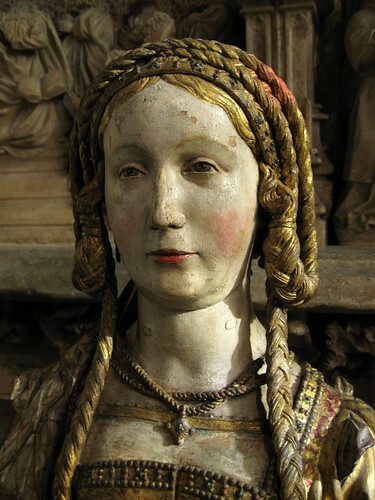 Yet, many of the "official" images of her--holy cards, plaster statues, and the like--tend to be more tempered with 19th century sentimentality than a real ecclesiastical sensibility. Some are historically illogical--it is hard to believe St. Joan would have worn the long encumbering skirts she is shown wearing, and often show her hair considerably longer than it would have been in truth. On the other hand, liturgical art is not an exercise in historical reconstruction or photorealism, and such reminders of her feminine genius show us that while men and women alike are called to fight under Christ's banner--in Joan's case, taking that banner into the ferocious heart of battle--the sexes have their own unique ways of manifesting courage and fortitude. St. Joan is shown in full armor, of an elegant simplicity and decorated with fleurs de lys, her pose reminiscent of medieval tomb slabs. She holds--in a somewhat exaggerated incarnation--the sword decorated with five crosses--she discovered buried under the floor of a church dedicated to St. Katherine as the result of a vision. The arms granted by the king to her relations is shown over her shoulder. Her swordbelt is decorated with the smoke and flame of her execution and the cross pommée associated with St. Michael, one of her famous Voices. Under her feet are the flames of her death at the stake, which dissolves into whorls of smoke that merge into the clouds of heaven. Overhead are her final words, "Jesus! Jesus! Jesus!" which also recall the inscription "Jhesus Maria" on her banner. At top, Christ is shown with the attributes of the Lord of Hosts. While this is a title we often associate with God the Father, the depiction is derived from an image in a medieval manuscript. The client requested that St. Joan be shown accompanied by SS. Louise de Marillac and Francis de Sales, two other saints important to his wife. St. Louise is shown in the standard iconographic manner (the direct precedent in this case is an image of her in St. Peter's), accompanied by a Daughter of Charity in the traditional headdress, holding up a foundling child. An angel above holds an escucheon of the order's emblem; the text on the scroll, translated, reads "The Charity of Christ impells us," a phrase associated with St. Vincent de Paul, St. Louise's priestly co-worker. St. Francis de Sales is depicted in the right-hand panel holding a book and pen, the book emblazoned with his emblem of a flaming heart, the symbol of charity. He is shown in cappa magna with a pectoral cross on a ribbon. I have seen and heard a number of things as to when use of the pectoral cross was permitted with the cappa magna, and whether it was used on a chain, ribbon or cord. My precedent here was an image of the theologian Bishop Bossuet in cappa magna--a figure of the following century, but with a pectoral cross and ribbon similar to one shown in an image of St. Francis wearing a mozzetta and rochet. An angel above carries the saint's personal arms, while the insignia of the Institute of Christ the King, which is under his patronage, is in the lower left-hand corner. The client and his wife are active in the local Institute apostolate. The motto Veritatem facientes in caritate, derived from St. Paul, is also associated with St. Francis de Sales. While this assemblage of saints has as its origin something distinctly personal, we see in this juxtaposition three great holy figures springing from the Church's eldest (if now rather wayward) daughter, France, and also bringing together the virtues of charity in action, truth in charity, and St. Joan's own very active witness to God's truth and justice. The community also has a very well done website, where they explain their origins. - a missionary zeal for the New Evangelisation, especially among the muslims. 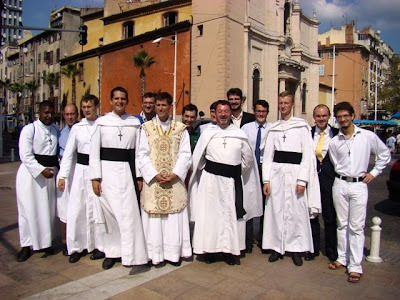 What I find especially appealing about this young community - presently consisting of three priests of the diocese of Fréjus-Toulon, seven seminarians, three youth in propaedeutic formation and three in discernment - is their strong missionary impetus, which nicely dispels the caricature sometimes made of those attached to the usus antiquior, i.e. being solely focused on the liturgy to the detriment of apostolic activity. As the Missionaries of Divine Mercy demonstrate, the two go hand in hand, and true and fruitful apostolic activity cannot but be rooted in and flow from the worship of Almighty God. These would seem to have been designed to hold relics of St. Ursula and some of her 11,000 martyred companions, and date from around 1525-1530, possibly from the Low Countries. 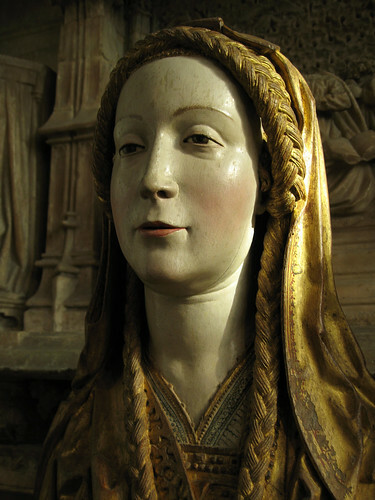 Another bust, kept at the main branch of the Metropolitan Museum of Art and of a similar appearance and vintage (one of a set of 23) can be seen here. The Wanderer is publishing the address by Msgr. Marini as a special monograph, and the paper kindly asked me to write an introduction - a rather intimidating assignment, I must say. Here is what I have written. Every Catholic has experienced it at some level, that culture of disdain for the past that has afflicted Catholicisim in the postconciliar period. It happens at our parishes, when a special guest lecturer talks about the supposed horrors Catholic school back in the day, or of how ridiculous it was that the Mass was in Latin, that we attempted to sing chant and did it so poorly, or that we went to confession behind a screen. We read about it in our catechetical materials, that contempt for what has gone before in the great age of ignorance and oppression that was finally swept away in the liberating Age of Aquarius. How unfortunate those people were and how fortunate we are in this enlightened age. Or so we've been taught. So pervasive has this attitude been that we can speak of self-hating Catholics as a widespread cultural phenomenon. Even in our own parishes, the absence of a positive self identity seems almost required as an ground rule for every conversation. "I don't want to go back to the past of course," we are expected to say before adding any critique of the present. This attitude - this hermeneutic of discontinuity, this positing of a great divide between preconciliar and postconcilar faith - has cut us off in a strange way. Wondering used book stores we find pre-1965 books on the faith and read them like relics. We don't recognize the pictures, understand the words, or even see a familiarity in the disciplines then and now. I can recall experiencing this in a parish environment in the 1980s, when I took an exam to qualify me as a CCD teacher. I had just completed a re-read and study of the Catechism of the Council of Trent, so one might suppose that I was ready. The test results came back: I had missed every single question. The pastor pointed out that this was a achievement in itself and so surely must be the result of a systematic error. I immediately realized that the purpose of the test was precisely to ferret out people schooled in the old ways, so I asked to take it again. He agreed. I answered every question that way any goofy progressive would answer it and thereby achieved a 100 percent score. My foot in the door, I taught the Baltimore Catechism for a full year to a roomful of kids, while hiding the books whenever there was a knock at the door. What we were doing all these years in which the past had been blotted out to us? We were impoverishing ourselves. The results are all around us: a barren land of lost and confused people who are sure of what we are not (Catholics of old) but unsure of what we are. It is of course true by definition that we can't go back: time only moves in a forward direction. The question really comes down to whether we want our future informed by the past or a future made up out of whole cloth. The truth is that Catholics cannot conceive of their own faith without reference to the past. The entire liturgical calendar is bound up with a continued retelling of past events in the life of Christ. We tell of the saints. We talk of the prophets and apostles. We do it every year, again and again. There is no such thing as Christian understanding without an understanding of the past. It is a grave and dangerous error to deracinated ourselves from a deep and abiding focus on where we came from. We must root ourselves in history, else our theology becomes a floating abstraction and our liturgy the invention of a single generation. It will take decades to repair the damage that this attitude has wrought, but we are all deeply blessed to live in times in which this process has decisively begun. The attempt to build a bridge between to old and new Catholic worlds affects every sector of Catholic life but it felt most conspicuously in the area of liturgy. Here we see sweeping changes making their way through the life of the Church, changes that rediscover and revive an liturgical ideal that has been part of the longest teaching of the Church. Liturgical translations are being improved so that they are translations and not merely vague paraphrases of the original. 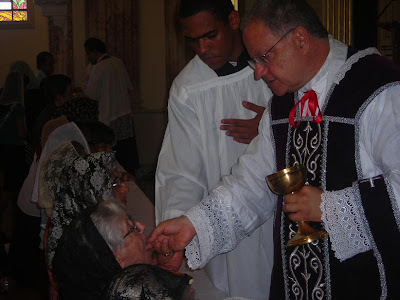 There is new interest in nobility and dignity in vestments. Gregorian scholas are being started around the country, while instructional conferences on singing chant are filling up months in advance. 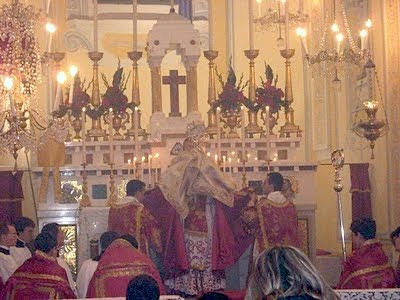 It is even true of tutorials on what Pope Benedict XVI has called the extraordinary form of the Roman Rite, the liturgical structure in place when the Second Vatican Council opened. We can all detect the difference that these changes are bringing about. With our eyes now opened to the past, and with a new freedom to learn from our history and tradition, we feel like we've been invited to tour a grand castle with a million rooms filled with treasures. We feel a sense of ebullience, moving from room to room in awe. But as with visiting any museum, we must resist the temptation to rush through the place too quickly. We need to be patient and disciplined as we going about the process, knowing full well that it will continue long past our own lifetimes. I can't imagine a better tour guide than Msgr. Guido Marini, the Papal Master of Ceremonies who delivered a spectacular address on January 6, 2010, at a Rome conference for the Year of the Priest. He covers the urgent need to make the spirit of the present and future consistent with the past. "The liturgy cannot and must not be an opportunity for conflict between those who find good only in that which came before us, and those who, on the contrary, almost always find wrong in what came before," he said. 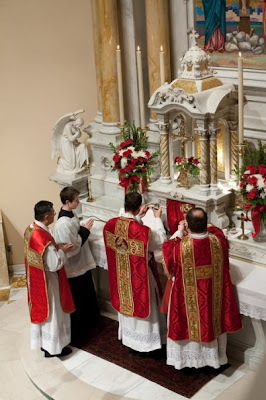 "The only disposition which permits us to attain the authentic spirit of the liturgy, with joy and true spiritual relish, is to regard both the present and the past liturgy of the Church as one patrimony in continuous development." His eloquence is magnificent in explaining why we must look back as a way forward on liturgy, and here we find that the liturgy is not merely a gathering of people looking inward; rather it is God's summons to be in God's presence, in the manner of a procession as led by the celebrant, in a ritual that emerged over hundreds of years so as to reduce the arbitrariness of human choice and personality. The liturgy asks us to pray with St. John the Baptist: we must decrease so that He can increase. Msgr. Marini speaks of the need for a full orientation toward this purpose, not only with a new emphasis on facing toward the liturgical East but also an orientation that affects even our choices of music. Liturgical music must be "anchored to the biblical or traditional texts" and it must be truly liturgical and not secular in text or form, and not even merely religious. Our music must bear the three marks: holy, beautiful, and universal. The ideal is now what it has been as far back as we can see: the chants of the Church, the chants that grew up alongside the ritual itself. Msgr. Marini has been a leader for Catholics of the world in the revival of the preconciliar form of liturgy and also in the reform of the modern ritual in a manner than makes it part of the great continuity of development that stretches from our times back to apostolic times. In this essay, he presents the rationale for reform from his perspective, from the perspective of the Pope, and also the perspective of uninterrupted Catholic teaching. There is so much to learn from in his speech, and it leaves us all with so much to do and for which we must all pray. The last the decades of forgetting our past has wrought terrible devastation, perhaps unprecedented devastated. But do not despair! After forty years of wandering, the promised land is in view. The changes are in motion. The teaching and hard work has begun. The ideals are being restored. As we move along the path as mapped out here, we all have a role to play. We must not depend solely on Rome's lead as a legislator. We must feel the inspiration and look to the model be given here and act on a local level to undertake constructive change. In this way, the change will take root and not be swept away in the next generation. This is gift we can leave for the next generation of Catholics, who, we can pray, will have a greater love for the faith and appreciation for tradition than Catholics have had for many generations. Under the leadership and inspiration of Msgr. Marini and Pope Benedict, we can surely learn to sing, pray, live, and believe like Catholics again. "Three times the crucified Christ came to life and said to him: "Go, Francis, and repair my Church in ruins." 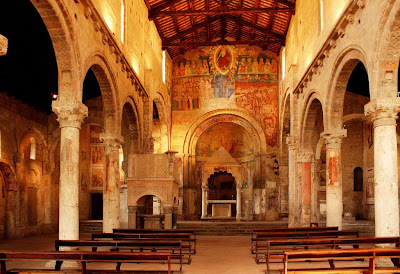 This simple event of the Word of the Lord heard in the church of San Damiano hides a profound symbolism. 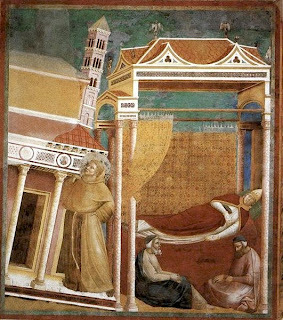 Immediately, St. Francis is called to repair this little church, but the ruinous state of this building is a symbol of the tragic and disturbing situation of the Church itself at that time, with a superficial faith that does not form and transform life, with a clergy lacking in zeal, with the cooling off of love; an interior destruction of the Church that also implied a decomposition of unity, with the birth of heretical movements. "This event, which probably occurred in 1205, makes one think of another similar event that happened in 1207: the dream of Pope Innocent III. He saw in a dream that the Basilica of St. John Lateran, the Mother Church of all churches, was collapsing and a small and insignificant religious supported the church with his shoulders so that it would not collapse. It is interesting to note, on one hand, that it is not the Pope who helps so that the church will not collapse, but a small and insignificant religious, whom the Pope recognizes in Francis who visited him. Innocent III was a powerful Pope, of great theological learning, as well as of great political power, yet it was not for him to renew the Church, but for the small and insignificant religious: It is St. Francis, called by God. "On the other hand, however, it is important to note that St. Francis does not renew the Church without or against the Pope, but only in communion with him. The two realities go together: the Successor of Peter, the bishops, the Church founded on the succession of the Apostles and the new charism that the Holy Spirit created at this moment to renew the Church. True renewal grows together." Grail: Happy the man whom you teach, O Lord, whom you train by means of your law; to him you give peace in evil days while the pit is being dug for the wicked. Revised Grail: Blessed the man whom you discipline, O Lord, whom you train by means of your law; to whom you give peace in evil days, while the pit is being dug for the wicked. NAB: Happy those whom you guide, LORD, whom you teach by your instruction. You give them rest from evil days, while a pit is being dug for the wicked. NIV: Blessed is the man you discipline, O LORD, the man you teach from your law; you grant him relief from days of trouble, till a pit is dug for the wicked. NASV: Blessed is the man whom You chasten, O LORD, And whom You teach out of Your law; That You may grant him relief from the days of adversity, Until a pit is dug for the wicked. KJV: Blessed is the man whom thou chastenest, O LORD, and teachest him out of thy law; That thou mayest give him rest from the days of adversity, until the pit be digged for the wicked. KJV21: Blessed is the man whom Thou chastenest, O LORD, and teachest him out of Thy law, that Thou mayest give him rest from the days of adversity, until the pit be dug for the wicked. NCV: Lord, those you correct are happy; you teach them from your law. You give them rest from times of trouble until a pit is dug for the wicked. Darby: Blessed is the man whom thou chastenest, O Jah, and whom thou teachest out of thy law; That thou mayest give him rest from the days of evil, until the pit be digged for the wicked. D-R: Blessed is the man whom thou shalt instruct, O Lord: and shalt teach him out of thy law. That thou mayst give him rest from the evil days: till a pit be dug for the wicked. Coverdale: Blessed is the man whom thou chastenest, O Lord, and teachest him in thy law, that thou mayest give him patience in time of adversity, until the pit be dug up for the ungodly. Of course this is only a few of the possible hundreds that have been published in 500 years. They are all slightly different, though each is more or less a rearrangement of what exists. The first two you have to pay to pray. The third you need permission but payments are largely foregone. The remaining are public domain, free to the world. The money to use the second one that is soon to be implemented will come from the pockets of Catholics in the pews. What is still unclear is whether there will be free options and how Catholics might go about using them. In the comments, feel free to add more examples. The Sacred Made Real exhibition at the National Gallery has "exceeded all expectations" with almost 100,000 visitors - triple the number of visitors expected by the gallery. The exhibition of Counter-Reformation Spanish painting and sculpture, from 1600 to 1700, opened on October 21 and closed on January 24. On Monday the National Gallery announced that it attracted 99,136 people. The exhibition included polychrome wooden sculptures that had never been seen outside Spain, where they are used in devotional ceremonies. They included the simple but realistic Mary Magdalen Meditating on the Crucifixion (1664) by Pedro de Mena. 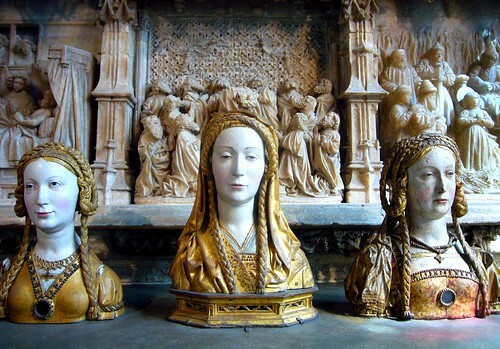 The paintings and sculptures were a product of the Spanish Counter-Reformation, when religious patrons, including the Dominican, Franciscan and Carthusian orders, challenged artists to bring the sacred to life. When the National Gallery launched the exhibition it said it was "created to shock the senses and stir the soul". Many of the works displayed the brutal treatment of Christ: the sculptures Christ as the Man of Sorrows (1673) by Pedro de Mena and Dead Christ (1625-30) by Gregorio Fernández, which used the bark of a cork tree to simulate the effect of coagulated blood, and bull's horn for Christ's fingernails. The artist's intention was that believers should feel truly in the presence of the dead Christ. 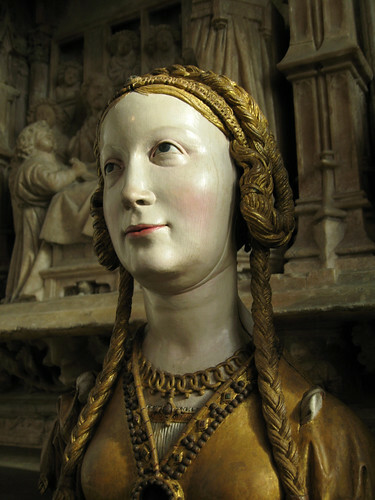 Both sculptors used glass eyes and tears and ivory teeth in their sculptures for greater realism. The sculptures were displayed alongside more familiar paintings, which included Diego Velázquez's Immaculate Conception (1618-1619). As well as the themes of the Immaculate Conception and the Passion of Christ, the 16 paintings and 16 sculptures portrayed a number of saints. It took the curator Xavier Bray three years to put the exhibition on, including persuading Spanish churches and monasteries to part with their devotional works. Pedro de Mena's St Francis Standing in Meditation (1663) had never before left the sacristy of Toledo Cathedral. The National Gallery had expected around 30,000 people to view the exhibition; the fact that three times that number came astonished them. Dr Bray told The Catholic Herald that it was "the immediacy of the images" that drew such a large number of people. He said: "The images of Christ were very truthful, profound depictions; you were meeting the Virgin, Christ and the saints in a very direct way." He said the visitors were of all ages, art students, Catholics, Anglicans and members of other religions. In a crowded gallery, he said, "there was a wonderful sense of silence - awe-inspired people. I met a Sufi woman in tears." When the exhibition was over and the last member of the public had left, Dr Bray spent about three hours in the gallery on his own. "I said goodbye to every single piece," he said. The impact of the exhibition was so strong that he hoped it would be remembered for the next 10 years. He alleged that his "dream exhibition" would be on Goya as a religious painter. 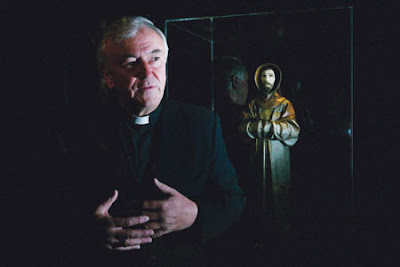 Days before the exhibition began in October Archbishop Vincent Nichols of Westminster took the press on a tour of three of the sculptures: The Dead Christ by Gregorio Fernandez, St Francis Standing in_Meditation and Mary Magdalene Meditating on the Crucifixion, both by Pedro de Mena. He said the sculpture of St Francis "takes us to the very heart of who St Francis is". "His face is raised to God, his eyes open, his mouth slightly open, and a posture that's both of utter surprise and also of recognition. Astonished delight to be approaching the presence of God as he was. But there's also recognition: this is fulfilment," he said. One blogger is writing a very insightful and funny series on what it is like to be a Church musician, offering his insights on the great battles of our times. His contributions are interesting and information. Here are some selections to whet your appetite. The Secret Life of Church Musicians: "People view musicians as having a gift, rather than a developed skill. It's something that just drops out of the sky without all the hours of practice that we do etc. This attitude can be flattering but causes problems. You see, musicians who have had a formal training do not just study their instrument...."
The Seven Commonest Faults of Church Music: "The point I'm trying to make is that when music liturgy is bad, it's usually bad in the same way, regardless of whether it is a trad liturgy or a modern one. Sorting out these problems goes a long way to a trad accepting modern and vice versa. Conversely, if it is left the way it is, it leads to divisiveness and falling congregations. Nobody wants to sit listening to a heavy organ playing for an hour. Again no one wants to sit and listen to out of tune guitars for an hour...."
The Curate's Sausage - How to Make a Hymnal: "The hymnal market is a niche market and as a result, something of a cartel. Unless a composer can get his music in on of the biggies, like Laudate, Hymns Old and New or the Celebrational, they can pretty much forget it. And they usually have to sell their soul to do that... It's a tough world out there for church composers, where the only fate worse than someone buying your copyright off you, is nobody wanting to buy your copyright off you. And the result of this is a curate's sausage of church music repertoire." Never Buy a Music Book with a Rainbow: "The decree that the congregation had to participate more, meant that the normal music forms for the Gloria and the Sanctus were dispensed with and a verse/chorus form introduced. The Gloria suffers particularly badly from this; it does not scan well and the sense of the words do not fit this at all. It should be through composed; that is, written without a break or repetition from beginning to end. The Sanctus fares a little better, but the Credo has disappeared off the face of the earth as a part of the sung liturgy." A few days ago, we celebrated the Feast of the Conversion of St. Paul. One of our Maltese readers sent in some photos showing the Cathedral of Mdina, Malta, festally decorated for the feast. The Mass for the feast was celebrated by the Archbishop of Malta. While our reader did not take any photos of the Mass itself, he did capture a couple of photos of the Archbishop processing into the Cathedral. The 7th Annual Advanced Gregorian Chant Study Week in Solesmes, France will begin the morning of July 19 and finish Friday evening, July 23. This chance to study in a small group with Dom Daniel Saulnier, O.S.B. and to hear the monks singing is the opportunity of a lifetime. The course has become an international event, with students from all over the world. As the monastery was founded in the year 1010, this year will be the "course of the millennium." The course, taught in English, is for advanced students only. Candidates should have a familiarity with Roman Catholic liturgy, liturgical Latin and be able to sight sing Gregorian chant notation. Text for the course is the Graduale Triplex. Prospective students should apply by emailing Fr. Saulnier. A friend of mine writes to point out that the iPad will mean a revolution in the distribution of music as well as text. It will permit tens of thousands of pages of chant and polyphony to be downloaded for free and carried anywhere in a form that can actually be used. This might not happen this year but this is the future. What it portends for the old model of publishing is striking indeed. The future is not, however, something that friends of sacred music need fear. 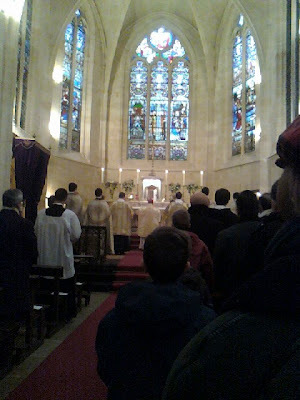 It has been a little while since we have checked in with the Institute of the Good Shepherd (Institut du Bon Pasteur), accordingly, I thought I would make note of the fact that this past weekend, Saturday, January 23rd, saw the ordination of a deacon as well as three subdeacons at the IBP church of Saint-Eloi in Bordeaux, France, by Mgr. Marc Aillet, Bishop of Bayonne. 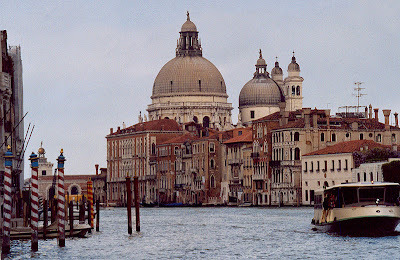 We recently showed our readers some beautiful photographs of St. Mark's in Venice and I am pleased that the same photographer, M.P. 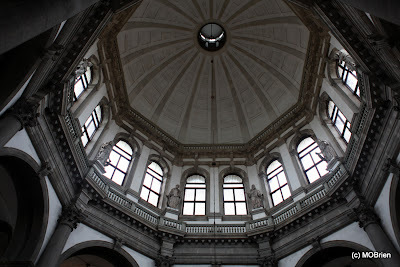 O'Brien, who provided those, also sent in to us some photos of another beautiful Venetian basilica, that of Santa Maria della Salute which was built and consecrated within the 17th century. 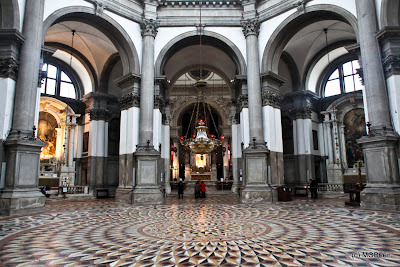 But first, an exterior photo by another photographer, which will give you a sense of the setting of the basilica -- and the lovely city of Venice itself. Fr. Finigan posted this from a correspondent on his site, The Hermeneutic of Continuity. 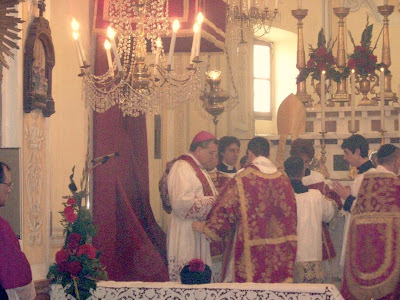 It presents a biblical, theological and liturgical rationale for "ad orientem". The quotation is quite rich. Issued January 6, 1996 by the Congregation for the Eastern Churches. 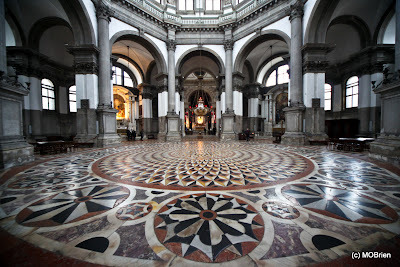 "Ever since ancient times, it has been customary in the prayer of the Eastern Churches to prostrate oneself to the ground, turning toward the east; the buildings themselves were constructed such that the altar would face the east. Saint John of Damascus explains the meaning of this tradition: "It is not for simplicity nor by chance that we pray turned toward the regions of the east (...). Since God is intelligible light (1 Jn. 1:5), and in the Scripture, Christ is called the Sun of justice (Mal. 3:20) and the East (Zec. 3:8 of the LXX), it is necessary to dedicate the east to him in order to render him worship. The Scripture says: 'Then the Lord God planted a garden in Eden, in the east, and he placed there the man whom he had formed' (Gen. 2:8). (...) In search of the ancient homeland and tending toward it, we worship God. Even the tent of Moses had its curtain veil and propitiatory facing the east. And the tribe of Judah, in as much as it was the most notable, encamped on the east side (cf. Nm. 2:3). In the temple of Solomon, the Lord's gate was facing the east (cf. Ez. 44:1). Finally, the Lord placed on the cross looked toward the west, and so we prostrate ourselves in his direction, facing him. When he ascended to heaven, he was raised toward the east, and thus his disciples adored him, and thus he will return, in the same way as they saw him go to heaven (cf. Acts 1:11), as the Lord himself said: 'For just as lightning comes from the east and is seen as far as the west, so will the coming of the Son of Man be' (Mt. 24:27). Waiting for him, we prostrate ourselves toward the east. It is an unwritten tradition, deriving from the Apostles." "This rich and fascinating interpretation also explains the reason for which the celebrant who presides in the liturgical celebration prays facing the east, just as the people who participate. It is not a question, as is often claimed, of presiding the celebration with the back turned to the people, but rather of guiding the people in pilgrimage toward the Kingdom, invoked in prayer until the return of the Lord." We mentioned this title here on the NLM some while ago, and I was very pleased to hear from the publisher, Roman Catholic Books, with news that this title will be available for general purchase this March. 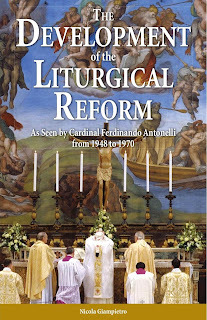 "Published for the first time in English and based on the diaries and notes of Cardinal Ferdinando Antonelli, a pivotal figure in the Catholic Church’s liturgical-reform movement both before and after the Second Vatican Council, The Development of the Liturgical Reform shows that the Council’s vision for the Mass has yet fully to develop. 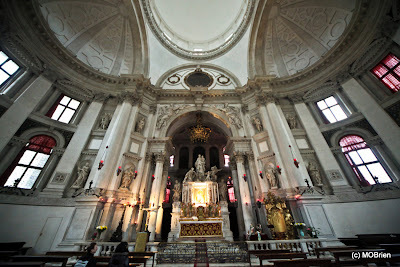 "Author Nicola Giampietro is an official of the Congregation for Divine Worship and the Discipline of the Sacraments." 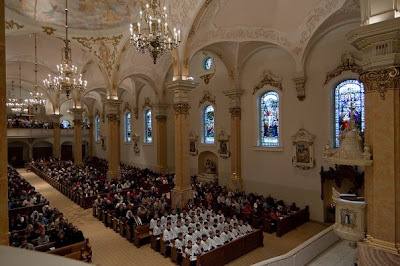 We were very pleased to be passed along these photos today from the feast of St. Agnes at St. Agnes Catholic Church in St. Paul, Minnesota, which was offered in accordance with the modern Roman liturgy. The celebrant is Rev. John Ubel, pastor of St. Agnes, and the music for the Mass was the Saint Cecilia Mass by Gounoud. 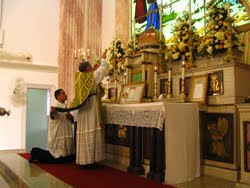 Mass was celebrated ad orientem and in Latin with vernacular readings -- the usual fare at St. Agnes for their primary Sunday Mass and for feast days. Most of us in OF parishes will not be singing the tract during Lent this year. Although ideal, it is extremely difficult, changes from week to week, and requires an expert schola and ample rehearsal time to do it justice. Another major obstacle is that your parish and your pastor are probably nowhere near ready for the tract in place of the now-accustomed Gospel Acclamation, "Praise to you, Lord Jesus Christ, king of endless glory." Here is what the St. Cecilia Schola in Auburn will be doing during Lent this year. It is a mode II, plainsong setting of the accustomed text roughly based on the melody for the tract for the First Sunday of Lent. But newly composed, really, with the integrity and beauty of the English language in mind. Accompanying verses (Ash Wednesday through Good Friday) are set to corresponding office tone II. It requires no accompaniment, and might serve you well as an alternative to what is found in most published OF resources. the effect is ‘unusual,’ but not truly modern, and is obtained by mouldings and shapes and colors which are the result of indigestion after a visit to Stockholm Town Hall, and the Neue Baukunst of Germany. 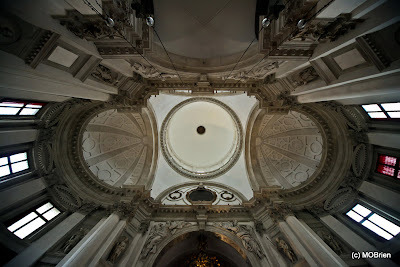 Some young man has thought he would invent new moldings, new window shapes, new pews, new light-fittings, and in his anxiety to avoid the admittedly bad “churchliness” of ecclesiastical fittings, he has gone to the other extreme and produced an arrogant decoration of his own. […] The trouble is that a ‘modernistical’ as opposed to ‘modern’ architect, mistakes unusual detail for the truly modern. The thing that matters is the function of the church. […] Style is a side-issue. 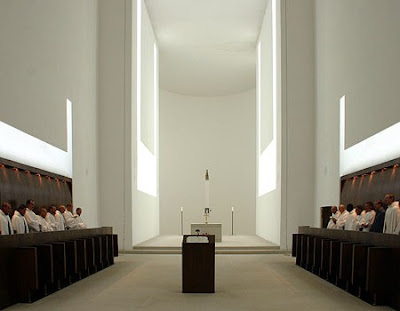 There is a clear difference between this monastic modernity, developed in continuity with tradition, which has as one feature of it a contemplative simplicity, and the modernistic taste for pseudo-primitivism and mechanistic minimalism. One springs from a spirit of noble sacrifice, putting aside a created good for a greater good, while the other comes out of a misplaced sense of “spirituality” that is really a sort of attenuated mentalism—I am what I think, I am not the God-created union of a body and soul. The monk has a body—admittedly one tempered by work, self-discipline, and fasting, but it is a body and not a skeleton or a disembodied spirit. 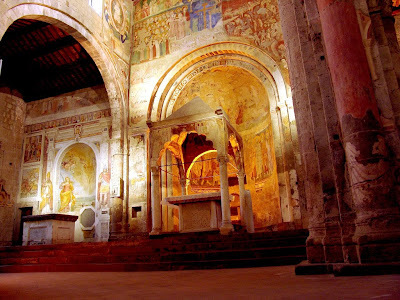 [It is useful to compare the] alien and disturbing starkness [of a modernistic building, as below] with the beautiful and timeless simplicity of the Romanesque. 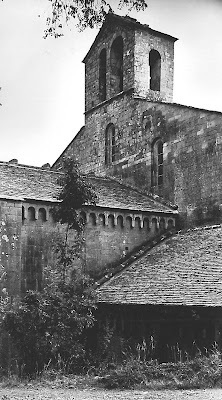 One can see, simply by comparing these two images, above and below, that even the most austere Cistercian architecture had a sense of humanity and warmth that is lacking in its faddy modernistic--but not necessarily truly modern--counterpart. The purity of the monastic life is rather different from the sterility needed to produce microchips. Have a look, and have some fun--for one thing, who else appreciates bizarre jokes about dead British rubricians? 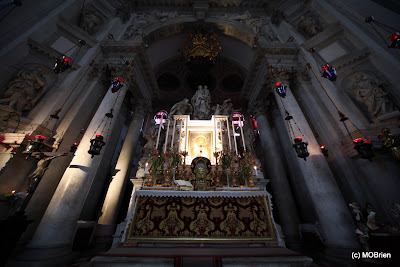 This past weekend, the small town of Artallo, thanks to the intelligent foresight of its parish priest Canon don Marco Cuneo, witnessed the true glory of the Pontifical rites of the extraordinary form. In fact, His Excellency Abp.Raymond Leo Burke, Prefect of the Supreme Tribunal of the Apostolic Signatura, celebrated a Solemn Pontifical Mass and Pontifical Vespers for the feast of St. Sebastian, Titular Saint of the parish. The concourse in terms of faithful and clergy from the whole Diocese of Albenga-Imperia and beyond was impressive and moving. H.E. Msgr. Mario Oliveri, the Diocesan Ordinary, whose fatherly benevolence has become universally known amongst those who love the traditional rites of the Church, and who celebrated himself the Pontifical Mass from the throne in the E.F. in Imperia in October 2008, benignly conceded the use of the throne and pastoral staff to the visiting Archbishop. 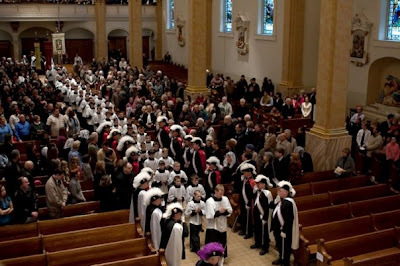 Canons form the Collegiate, Cathedral and Metropolitan Chapters of Albenga, Imperia, Genoa and Milan attended the ceremony. Thanks to Can. 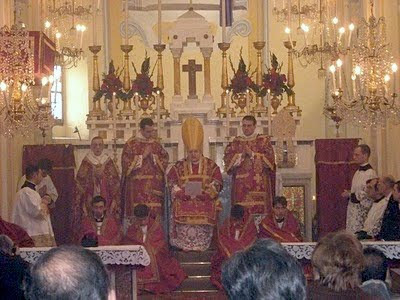 Cuneo's great liturgical competence and human kindness, we were able to enjoy the spendour of some of the most solemn ceremonies of the Roman Rite within the frame of the joyful, fervent devotion of a Catholic town to his Patron. Thank you, Your Excellency! Ad Multos Annos! N.B. Further details of the ceremony on messainlatino.it and maranatha.